Steph and Rich had their wedding reception at the Bank House Hotel in Worcestershire. For the morning of her wedding, Steph had hired the Bank House's penthouse apartment, allowing her and all her bridesmaids to get ready in the same place. Steph's bridesmaids had not seen her wedding dress, so in order to keep the surprise, she decided to get dressed alone, with the help of her hairdresser. The entire morning had been really fun, with everyone laughing and joking and generally having a good time. 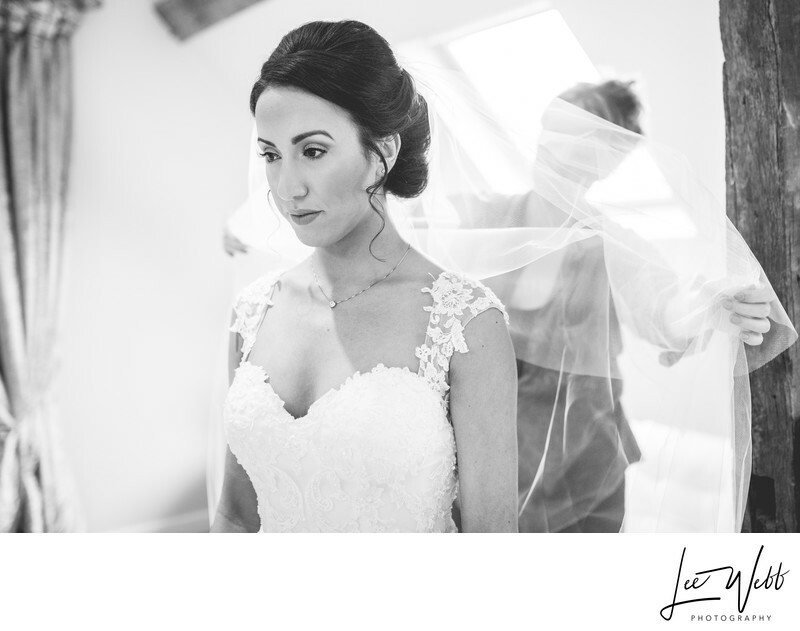 It made for quite a stark contrast when Steph was left to get into her dress alone, as we had the first moment of absolute calm and silence all morning. I waited outside as Steph got dressed, and was called back in to take some photos of the dress being done up, and her veil being put in place. This is one of my favourite photos from this time. The look on the bride's face is clearly that of quiet contemplation, and of calm. At the same time the hairdresser is making sure the veil sits correctly, allowing it to be seen more clearly in the photos. I shot this black and white photo with my 85mm portrait lens in order to blow the background as out of focus as I could get it, making sure to focus in on the bride.